Finally got a new bench built. Used to have a kobalt workbench that the surface was just laid on top. 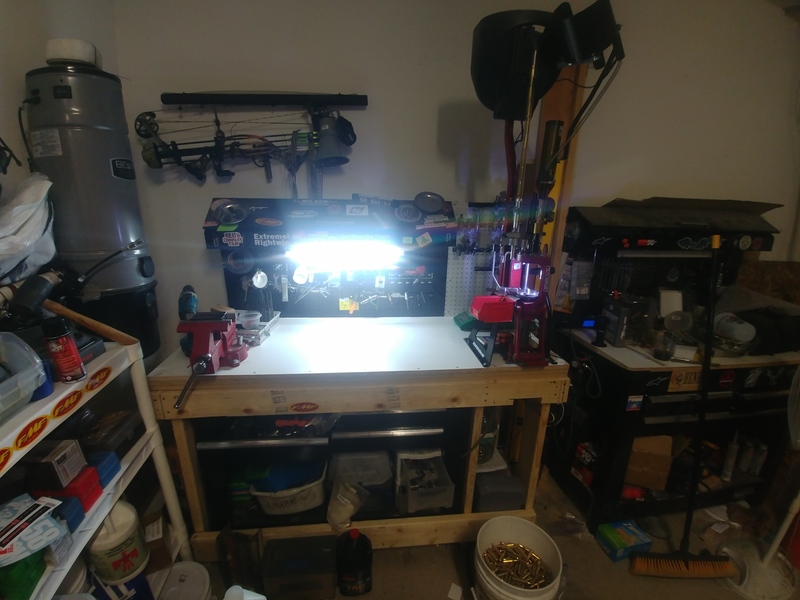 Kept the kobalt bench for the drawers shelf and backboard and built my bench around it. 2 layers of 3/4 inch mdf and 1 3/4 inch melamine board. Added a case feeder and Mr bulletfeeder to the lock n load at the same time. Ran it a little and liked it but decided it was in between sitting and standing height so an inline fabrication stand was ordered along with their bushing brackets (allows storage of dies in LNL bushings which are on the white peg board) and some press lights. Very nice. Going to be reworking my set up soon. Larger bench and pegboard is on the list. Does the Mr. Bulletfeeder work well? Once it's tuned it works awesome. The angle the price that holds the bullets sits at is the biggest adjustment. I set it at 45 and started messing with every other adjustment trying to figure out why the bullets would start to flip right side up then just not fall vertical. I had to change it to about 40 degrees and they fall perfectly now. Only issue is it's not designed for the lnl, the bullet feeder die rubs the powder dispenser, some have dremeled a small notch in their die to prevent this. I added a spring to put return pressure on the die but I need to add one more. Since I'm loading rifle and my brass is all prepped I just moved the powder to station 2 and bullet drop to 3 to avoid the rubbing.